Almost seven months after the platform's launch in March, Android Wear may already be preparing for its first update, according to Android Police. And it could have some goodies you've been waiting for. Citing an anonymous source, the site believes Google could be pushing out Android Wear 2.0 (official name pending) on or around October 15th. Though unconfirmed, early speculation is that this update will get much needed GPS and Bluetooth headphone support as well as an easier way to develop custom watchfaces. It also comes conveniently around when we're expecting a Moto 360 and G Watch R release, so maybe some optimization for round watchfaces as well, though that's purely speculation. 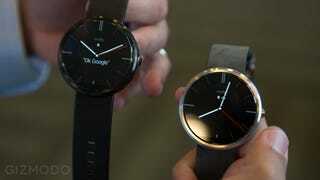 Android Police's insider info corroborates an earlier report, published by CNET, that spoke with Android Wear Design Director David Singleton. Singleton mentioned that updates for Wear would be fast and furious with multiple being planned before the end of the year. The rumored October 15th update might just be the biggest one among many. Such a rigorous update schedule would only solidify Google's wearable lead ahead of Apple, whose long-awaited iWatch may not ship until early 2015. By then, Android Wear could already be making solid progress on a third major update.